I was chilling in Rose Hill a couple of weeks ago and since I had some time to burn, I decided to go check out some books at Le Cygne. I used to go to Le Cygne a lot several years ago but then completely stopped as they stopped bringing in interesting books and were soon taken over by Bookcourt. They also seem to focus a lot more on school materials these days and since Mauritius is not a country of book readers, it makes sense that they would focus on whatever equates to better profit for them. 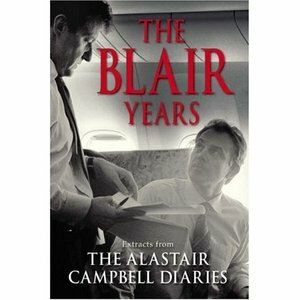 However, on this occasion, I actually stumbled upon a book worth buying: The Blair Years. I'm not a big follower of UK politics these days but my thoughts ran like this: Tony Blair, Alastair Campbell, Gordon Brown (maybe), how could I pass this up? And pass it up I certainly did not! It took me around 2 minutes to decide to buy the book and that's when I entered The Twilight Zone. The book's price was advertised at Rs 624.99, which initially seemed very strange. But then I concluded that maybe this was a homage to the UK where this pricing structure is the norm and walked over to the till to pay for it, knowing full well I would wait at least one month to actually start reading the book. When I reached the check-out lady and handed the book, she punched in some keys in the register and the price showed Rs 624.99 as written on the book. And here's where it gets SPOOKY! I handed her a Rs 1,000 note and was handed back Rs 375 in change. So where did the one cent go? I first thought that they just rounded off the price as giving back 1 cent was as annoying as it sounded. However, the till had shown Rs 624.99 as the exact price. So again, where did the one cent go? The receipt is saying they are actually charging me for Rs 624.99 and returning me Rs 375.01. However, this is not what happened. I was literally robbed of one cent. Sure, it's "only" 1 cent and who the hell cares about 1 cent, right? Think about it this way: let's say they sell 10,000 books a day (highly unlikely in Mauritius) and they do this every single time; calculate how much extra this leads to in one month. It quickly adds up! The second thing is that this kind of pricing strategy is bound to be frowned on by the Mauritius Revenue Authority. There was no VAT charge on the book but I imagine all the book stores in Mauritius (and Le Cygne is far from a small shop) must submit financial reports every year that includes how much money they made and their profits. Since their receipts are showing one thing and they are doing another thing when it's time to pay, I imagine their reports don't reflect the reality. Most importantly, what is this madness? Why not just round off the book prices and not open themselves to scrutiny by an obscure blog because of this crap .99 idea? This gets even crazier as when I pointed to the till lady that she did not return my change correctly, she had no idea what I was talking about - which again completely proves that it's a normal thing at Le Cygne to forget about the one-cent. I then proceeded to remind her that the receipt showed she had returned me Rs 375.01 when it was not actually the case, and that's when she bothered to return me the one cent which I of course proceeded to high five in her face because I'm that rad. Yes, it is only one cent but I am of the belief that customers should never have to pay more than what's on the price tag. I also discovered one more thing: this pricing strategy probably works very well here as most people would not bother asking for their one cent back (I asked around as research for this blog post and only 2 persons said they would have asked for their change back). Again, let's imagine that they are doing this on a large scale as I outlined above and it gets horrible. Personally, I am never buying from Le Cygne again. This one cent has cost them a customer.